Backwoods In The Pearl is located at the corner of NW Everett and NW 11th Avenue in Portland’s Pearl District. 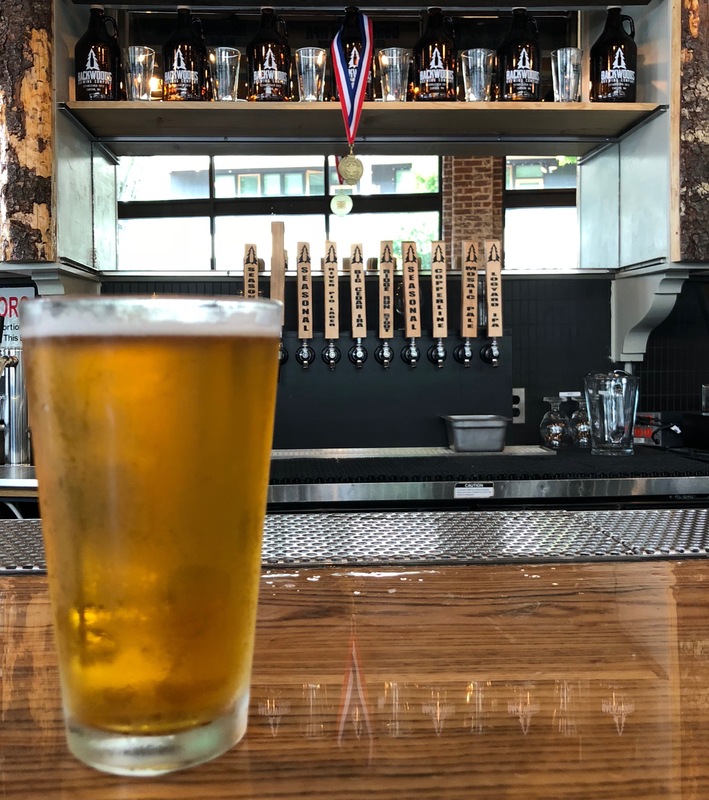 The latest brewery to open up in Portland’s Brewery Blocks is an out of state brewery from the Columbia River Gorge. 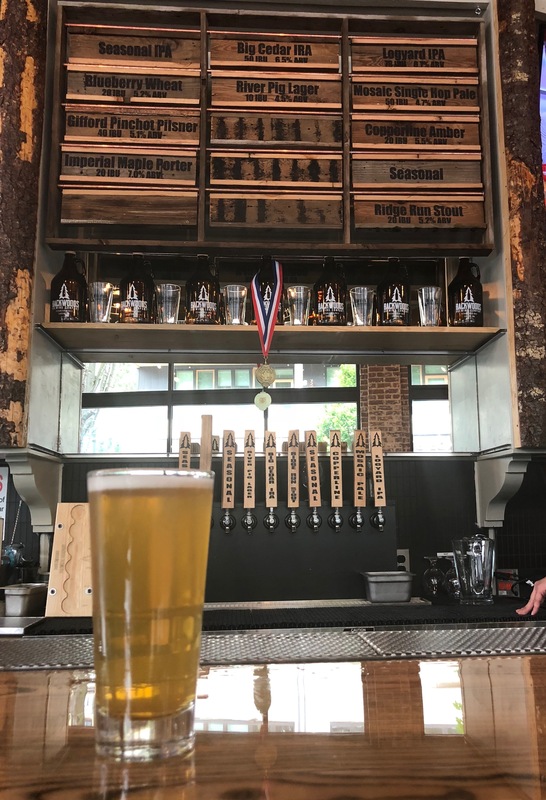 Earlier today Backwoods Brewing opened its doors to the public serving its Washington brewed beers at its new Backwoods In The Pearl. 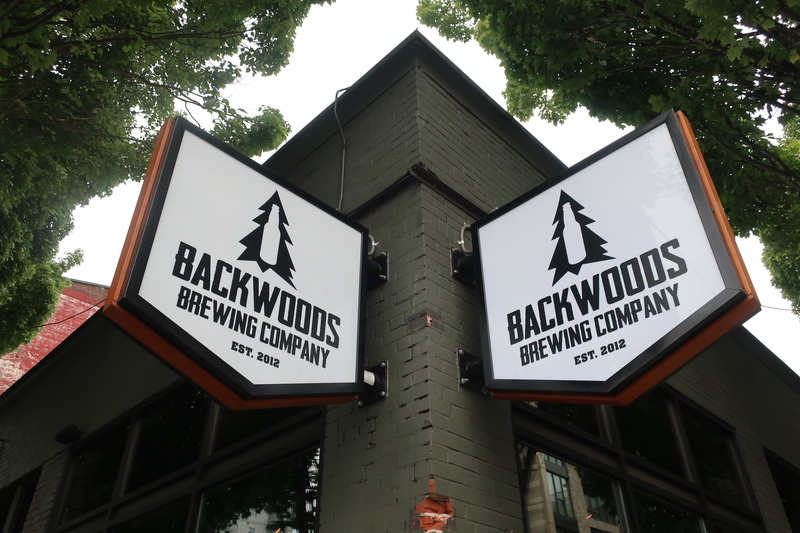 In mid-June Backwoods Brewing announced that it was taking over the recently closed Pearl Tavern, an upscale sports bar and restaurant operated by Portland’s ChefStable group along with former NFL quarterback Joey Harrington. Even on this hot corner in the Pearl District with the streetcar traveling by every 15 minutes this bar had trouble financially and abruptly closed. 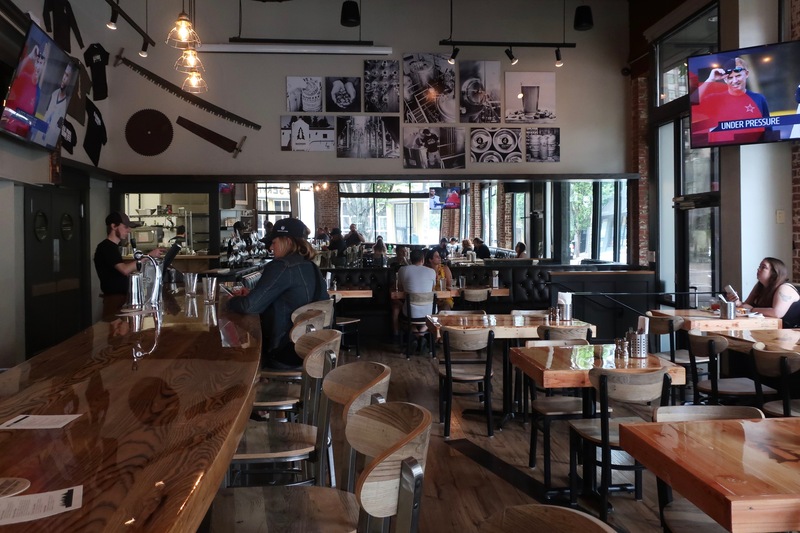 The building is still owned by ChefStable as it leases the space to Backwoods Brewing of Carson, Washington. Backwoods Brewing Mosaic Single Hop Pale at Backwoods In The Pearl. 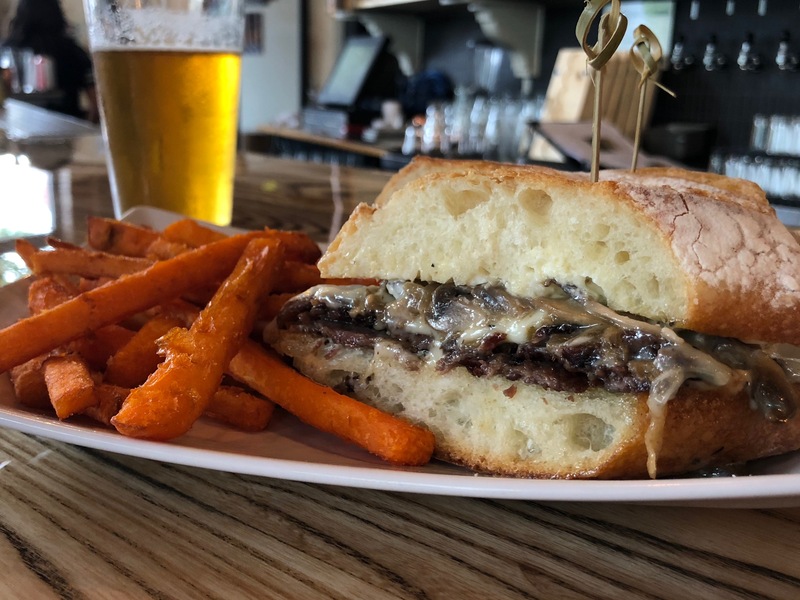 During the past four weeks the space has been remodeled to bring in some Columbia River Gorge charm from the former tenant’s upscale sports bar theme. The space is not too large, but offers a comfortable space to gather for a meal and a few beers. Upon entering Backwoods In the Pearl one will notice a large open space with a long bar that seats around 18 or so. Three TVs are above the bar and two additional ones are in the dining area. Outside of the bar there are numerous tables with chair and bench seating. And when you’re on your way out there’s a beer cooler with a few of the can and bottle offerings from Backwoods along with a selection of merchandise. A sort of half pint pour of Backwoods Brewing Out of the Haze IPA, its current seasonal IPA at Backwoods In The Pearl. The remodeled space at Backwoods In The Pearl. Backwoods Brewing’s tree bottle logo is stamped into the bar at Backwoods In The Pearl. On tap are up to 14 beers, one dedicated to Nitro alongside a full service bar. Most shaker pints are $6.00 each. The sole beer menu is a large menu board that sits above the main row of taps. One thing missing on the opening day was a printed beer menu that offers up full descriptions of the beers on tap. That said the team at Backwoods was eager to describe the beers in full detail. During our visit we enjoyed the new seasonal, Out of the Haze IPA that’s a filtered IPA that offers up many of the attributes of a juicy yet hazy IPA. We also really enjoyed the Mosaic Single Hop Pale. 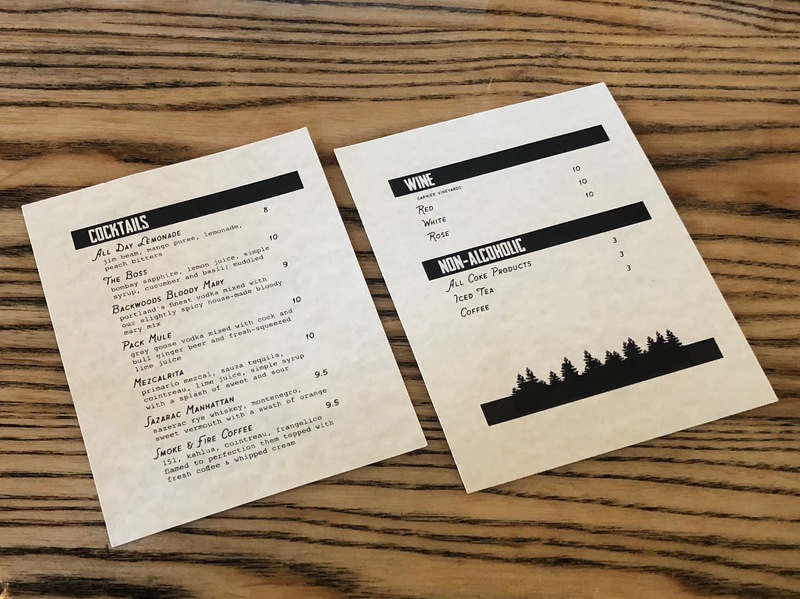 Cocktail and wine menu at Backwoods In The Pearl. Food menu at Backwoods In The Pearl. Speaking of the staff, Backwoods In the Pearl recruited a few of the beercentric folks from nearby Henry’s Tavern. 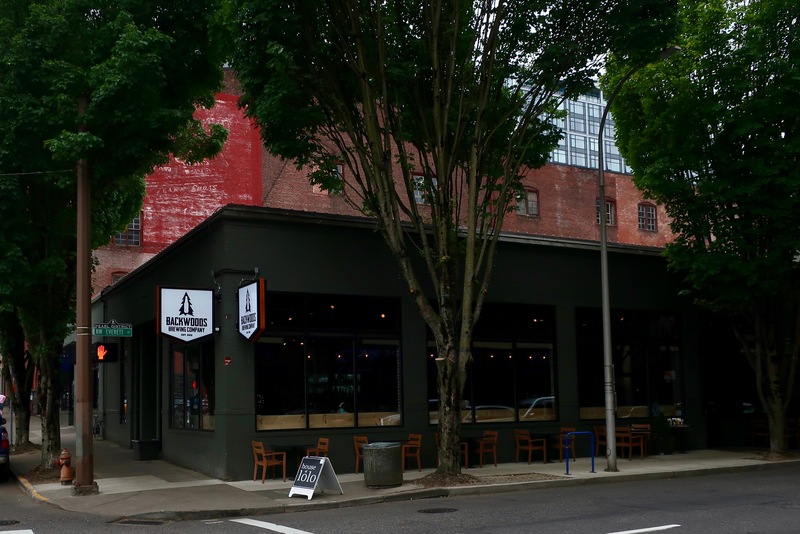 This was a great move on the part of Backwoods as this neighborhood is chopped full of excellent beer destinations with Deschutes Brewery on the same block and Von Ebert Brewing, 10 Barrel Brewing, Rogue Ales, and BridgePort Brewing just a few blocks away. To compliment the beer offerings Backwoods has an enticing cocktail menu with very affordable pricing, especially for the neighborhood. It also offers a concise wine list. 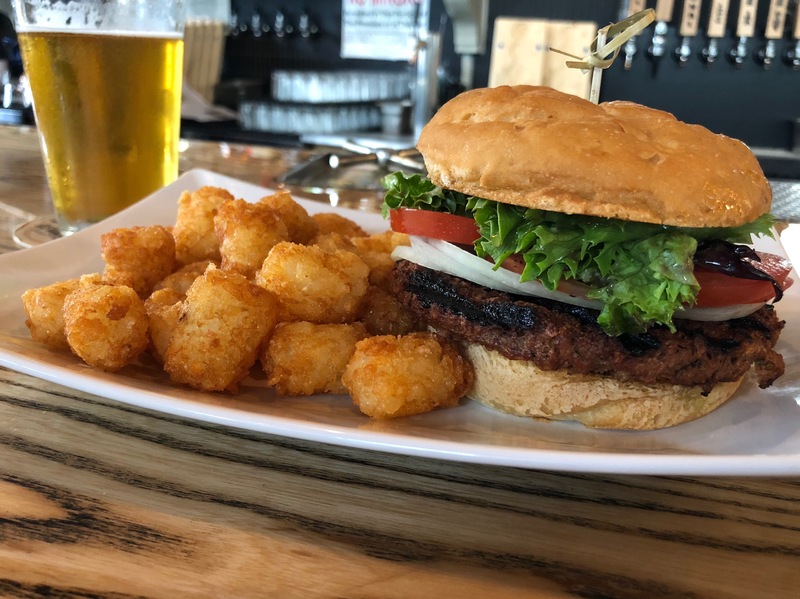 Impossible Burger at Backwoods In The Pearl. 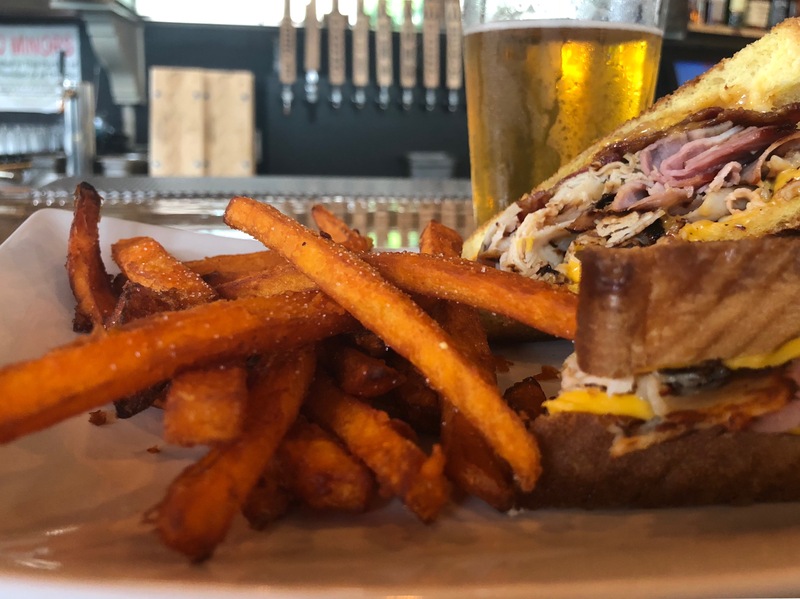 Grilled Turkey Club at Backwoods In The Pearl. Brisket Sandwich at Backwoods In The Pearl. 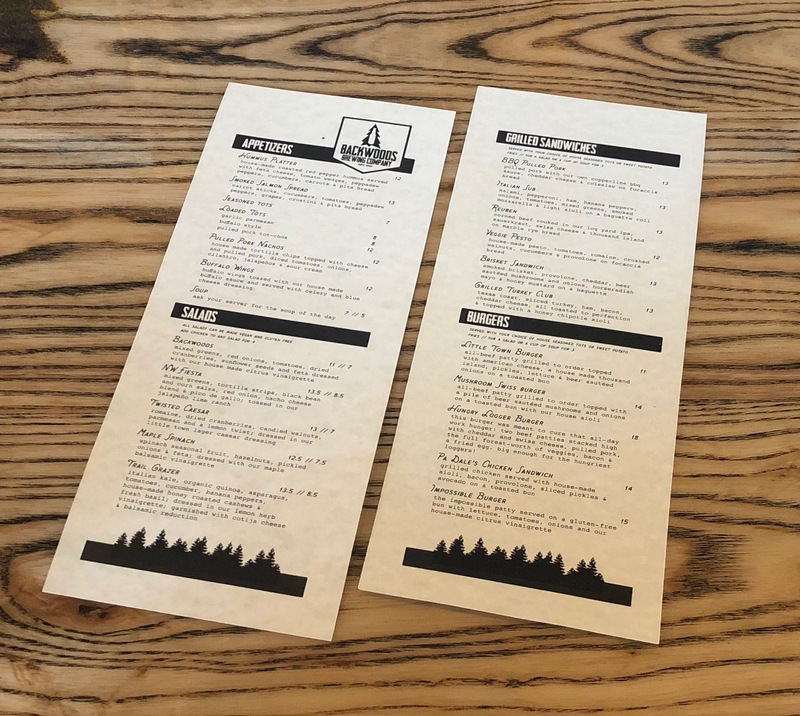 The food menu at Backwoods In The Pearl features a variety of appetizers, salads, grilled sandwiches and burgers. During our visit at lunch today we had the Grilled Turkey Club, Brisket Sandwich, and Impossible Burger. All three were tasty as the staff continues to get its feet wet during the pub’s soft opening. Backwoods In The Pearl is located in Portland’s Brewery Blocks. Backwoods In The Pearl is open seven days a week from 11:30am-10:00pm Sunday – Thursday and 11:30am-11:00pm from Friday – Saturday.